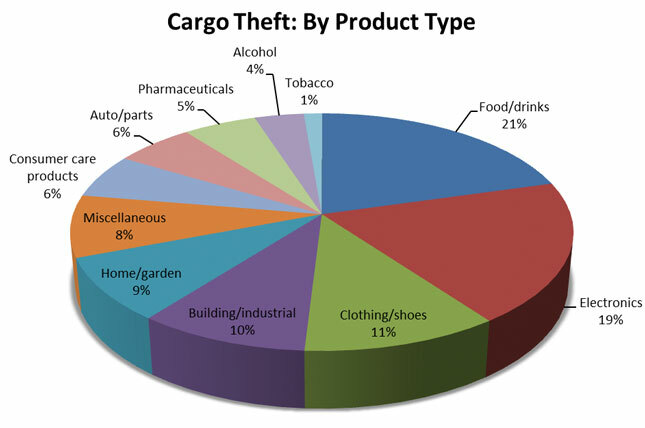 Off the top of your head, what would you guess is the largest category of cargo theft in the United States since 2008? It was almost shocking to me to learn this, but it’s food & drink! So why would food cargo be the most stolen category, you might ask? These are always complex issues, of course but it appears that the most prevalent reason is that cargo in industries with higher value goods such as pharmaceuticals are hardening their supply chains, causing thieves to look elsewhere for easier targets. As low security/high value targets diminish in number, cargo thieves must broaden their scope of malicious activities to less protected categories of goods. Statistics show that the food and drink supply chain is particularly vulnerable to theft, with over 99% of companies in the industry failing to institute a layered security approach in their shipping and logistics operations. With the exception of nut growers in California, little has been done in the food industry to reduce the attractiveness of cargo goods to thieves. The most popular sub-category of food cargo theft is beverages, specifically water, tea, soda and and juices. While not as frequently stolen, seafood and nuts represent a significant loss category due to the higher value of individual shipments. The average value of a seafood theft is $2ook and represents roughly 50% of all food cargo thefts that occur with a value in excess of $250k. Another significant segment of food goods theft which represents the third most targeted category is meat, which sits at the intersection of high value and and frequently stolen. The fourth most stolen category is canned and dry goods with an average lost value approaching $80K per theft. To summarize, food and drinks theft will likely continue to rise in volume and value as organized criminals and other thieves look to recoup ill gotten gains that have been reduced by other industries with added layers of protection. There are many reasons for companies shipping food cargo to institute more stringent security procedures. First of all, food companies must pay high insurance premiums to protect their cargo. In addition, disruptions in the supply chain that are caused by beverage and food cargo theft can create even greater “opportunity costs” due to stock-out conditions at retail and restaurant customers. These insurance premiums can be reduced by outfitting trailers and other containers with tracking devices (OpticalLock can help here – more on that later). These tracking devices can reduce supply chain disruptions by preventing theft upfront or or enabling the quick recovery of the stolen goods in many cases. This is not just an issue for shippers but for freight carriers as well. The theft of cargo represents a customer service failure which undermines the reputation of a carrier and its downstream ability to secure further business from the shipper of the stolen goods. If it happens enough, this reputation stain migrates from not only an account issue to a broader market issue, which can have a devastating impact on a carrier’s business. Employees are also not keen on being a victim of theft; loss of valuable drivers can also result from too many incidents of cargo theft because they no longer feel safe, further eroding a carrier’s ability to compete. The need to demonstrate a lack of tampering with food cargo cannot be underestimated in today’s market. Of course, it is critical to comply with new regulations such as the Food Safety Modernization Act (FSMA). But a food vendor’s reputation for having pure food delivered via a pristine supply chain is critical to long-term success. So providing evidence of non-tampering in the supply chain is even more critical to a food vendor’s bottom line than preventing the actual food cargo losses themselves. Many incidents over the years have shown how a scandal involving food purity or safety can send a highly-thought-of food brand spiraling downward, seemingly in the blink of an eye. (OpticalLock can also help provide this evidence of non-tampering – again see below). These factors are creating conditions in the market which are causing food shippers to become more diligent in selecting carrier partners, as well as presenting them with contracts that take a “zero tolerance” approach to trailer breaches and cargo tampering. Carriers as a result need to invest in modern security technologies and equipment to prevent theft, as well as alarming trailers with advanced tamper-evidence devices. As we’ve discussed in many of our other articles on freight and cargo security, a layered approach as being most effective for goods that are high value or frequently targeted. The OpticalLock system can enhance freight protection and security of food cargo in a number of the areas listed above. The OpticalLock system is an IDEAL multi-function security device for this application because it combines the capabilities of a standard padlock, security seal, tamper-evidence & alerting and shipment tracking. OpticalLock serves as a trailer lock while continuously monitoring all anomalies and attempts at lock tampering, sending real-time alerts to designated carrier or shipper personnel in the event of any out-of-band activities. The lock contains GPS tracking capability, showing where the lock and corresponding trailer is where it is supposed to be at all times along the designated route. The OpticalLock web-based management software provides flexible functionality to create custom “Geo-fences” which creates boundaries for generating wireless alerts if the shipment leaves a predetermined route or area. Maybe most importantly, the OpticalLock system gathers operational and security data which can be used as both as an audit trail to verify chain-of-custody and assist in proving evidence of non-tampering, but also as the basis for predictive modeling of security issues. The management software component of the OpticalLock system is highly secure, utilizing multiple layers of AES 256-bit encryption for all wireless and internet communications as well as stored data. Learn more about OpticalLock and our product line using these links. We welcome your inquiry via our contact us form. So please contact us today to explore how OpticalLock products can improve your food cargo security today!